I wasn't sure if I was ready to attempt this again, but I did. This time it was for a friend's daughter (she gave it to her as a Christmas gift). It wasn't so bad and I made a general pattern of it as I went along, so maybe recreating another time would be much easier (maybe put a few in the shop sometime later). 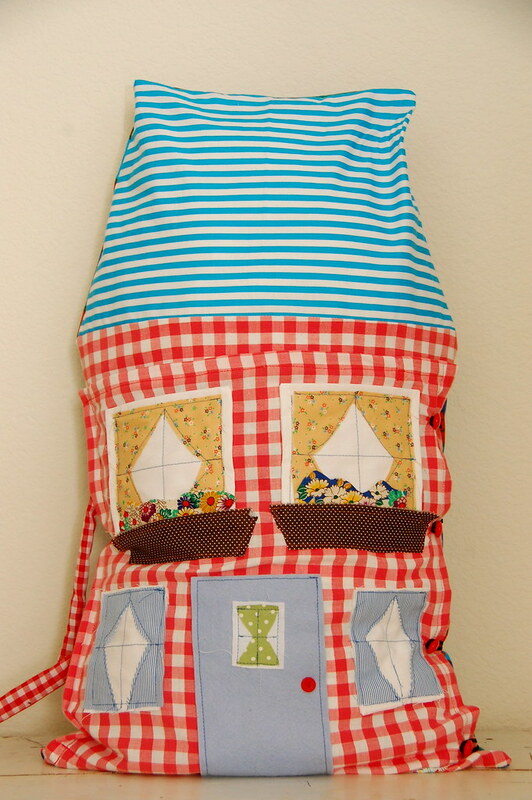 It wasn't quite as large as Brave's, but the dollhouse pillow still came out really cute. Then again, what little girl wouldn't like some sort of dollhouse pillow in any size?!! I also made two more, but smaller versions, and it didn't open to reveal an inside. Though the windows were pockets to be sure and give the girls some little places to hide their gadgets and gizmos and such. To compare sizes, Brave's pillow is on the left and the medium-sized one on the right. Though, the medium-sized one was still pretty big, as it was about the size of a standard pillow. I know some have emailed me about making some of these and I have turned them down, but maybe I might be comfortable enough in the new year to eventually put a couple in the shop. Can't make any promises, but maybe just maybe. Keep your fingers crossed. Belita loves hers and hugs her and carries it around , SHE LOVES IT! She kisses too. I wasn't sure SANTA got one from you but she was really surprised he DID! They are so sweet! I just love the inside rooms! gorgeous, just gorgeous. Wonderful job. I do hope you take on the challenge again and make some more for the shop, they will sell like hotcakes. i had thought to ask you to make one for eleanor for Christmas, but i thought it might be asking too much. if you do put them in your shop, i hope i'll be able to get one! Maybe you should draft a pattern for these and then sell them. Love your blog. Happy New Year! that is sooo creative and absolutely adorable! These are too cute! 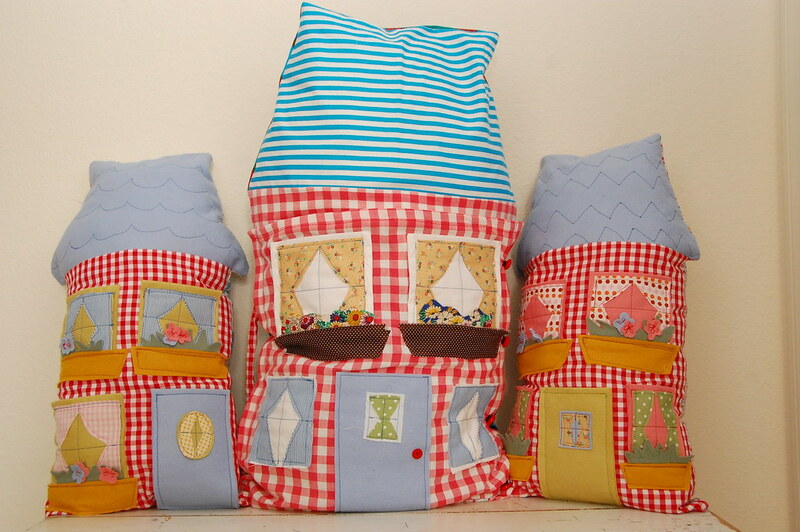 You should definitely sell them so other girls can have their own dollhouse pillow... what a great idea! this is so darling i could cry...oh to be a little girl again and discover this under the tree!! consider my fingers crossed! please DO add them in your shop! LOTS of them! These are so cute. I totally wish I had little girls to have these kind of toys around the house. I am on my third boy! so no dolls for us. keep up your talented work! Oh my gosh, so cute, I love them! These are AWESOME!! I would have killed for one of these when I was little, and my daughter would have adored one. She was always collecting little things. I hope you make some the put up in the shop or at least leave a DIY tutorial on how we can do it at home! I would love to make these for some cousins of mine (they are young little girls). I would definitely buy these if you put them in your shop! In a heartbeat. These are the most precious pillows I have ever seen. 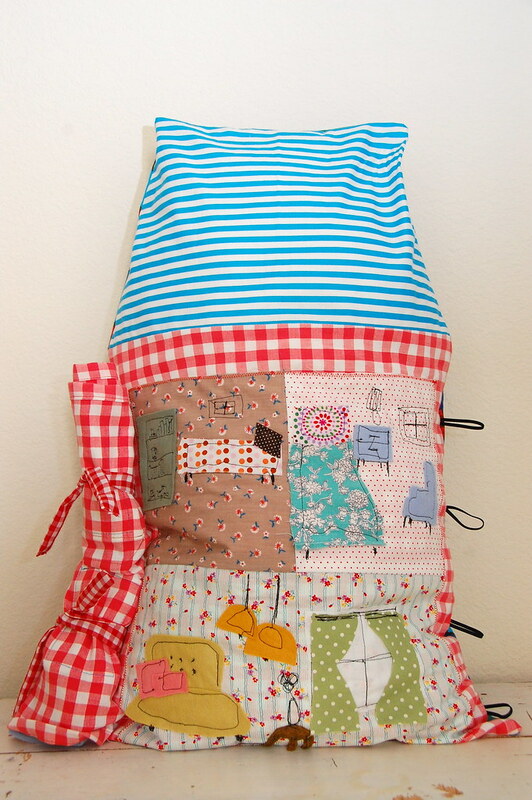 It actually gives me the bug to make one for my girls...and I don't sew! I would definately buy a pattern or DIY tutorial if you put it in your etsy shop. Happy New Year! i would absolutely purchase some of these from you if they make it to your shop. they are beyond precious! You are genius, even with mastitis! I love the room details on the back, I;m sure they could stare at it for hours. I love these pillows....I think every little girl (of any age! )would love one. 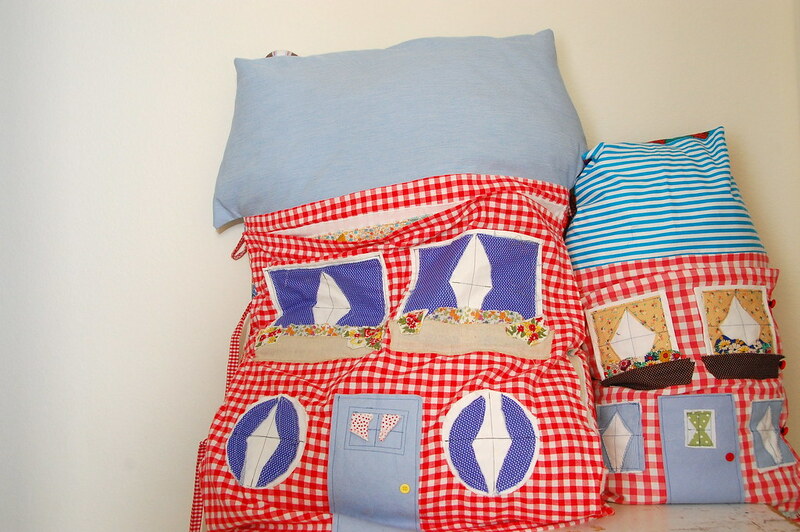 I custom-made some pillows for my 3 nieces (aged 19, 20, 22) for Christmas using gingham, buttons and bows and some t-shirt transfers. I love your blog, which I read about in 'Artful Blogging'.